Can Hamas Rein in Islamic Jihad? Masked gunmen from the Islamic Jihad organization pray before a rally celebrating the Israeli pullout from Gaza in Beit Lahiya in the northern Gaza Strip. Hamas may have emerged victorious over Fatah in Gaza. But there was another militant group with clout in that thin strip of Palestinian territory. And now Hamas must reckon with it as it figures out how to keep a semblance of peace with Israel. 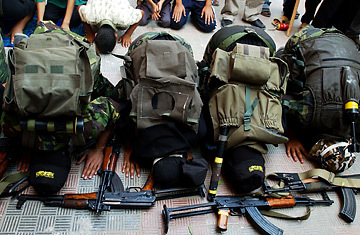 Among Gaza's many militant groups, the boys of Islamic Jihad have a different swagger. They walk with death in their shadows, and they move with the stiff pretense of being unafraid of it. Of course, they don't call it death but "martyrdom," and it awaits them in the form of an Israeli missile when these die-hard teenagers creep out into the orange groves and sand dunes to launch rockets at Israel. The militants know that after they fire off their homemade rockets, they have only a few seconds to sprint away before a guided Israeli missile comes flaming in. Islamic Jihad admits to losing over 70 men this way last year. And yet they persist. In Gaza, there is no shortage of young men who are mesmerized by the idea of a warrior's death. Islamic Jihad's activities are now under intense scrutiny, not only by the Israelis but also by fellow militants Hamas, who assumed power in the Gaza Strip after a short but brutal fight with Fatah, a movement linked to Palestinian President Mahmoud Abbas. For now, Hamas is trying to avoid provoking Israel into attacking the Gaza Strip. Instead, say Hamas officials, they are trying to restore order and calm after what one human rights activist described as the "organized, orchestrated chaos" that reigned during the power struggle between Fatah and Hamas. And to gain a breather, Hamas leaders say they are willing to observe a truce with Israel. But Hamas knows that the cease-fire will never succeed unless Islamic Jihad also signs on. A commander named Abu Ahmad agreed on Thursday to meet a TIME correspondent and two other journalists in an empty office borrowed by Islamic Jihad in downtown Gaza. Abu Ahmad appeared in the doorway in a black vest and matching black jeans like a gunslinger. In his thirties, Abu Ahmad is far older than the teenagers he dispatches to martyrdom. Would he cease attacks on Israel at Hamas' request? "Hamas would never ask us that," he retorted. "It's not possible for a resistance movement like Hamas to ask us to stop shooting." His grim prediction is that a "new era of struggle" between Israel and the Palestinians will soon start, one that is "highly escalated." During the fighting last week in Gaza between Hamas and Fatah gunmen, he said that Islamic Jihad had refrained from firing rockets at Israel. "We decided to stop launching rockets until we could see what developed," he explained. His organization's penchant for brave but foolhardy attacks has made it immune to realpolitik, and it may take some persuading by Hamas to convince Islamic Jihad to hold off its attacks. Already, Islamic Jihad has jumped back into the fray. With Hamas' takeover of Gaza scarcely hours old, Islamic Jihad unleashed a barrage of eight rockets on the Israeli towns. "There was an incursion by the Israelis into Gaza, and we decided to retaliate," Abu Ahmad explained. Despite the commander's hard line, others in Islamic Jihad may be more flexible. A Hamas spokesman, Sami Abu Zohri, claimed that Gaza's new rulers would soon talk with other militant groups to persuade them to abide by a Hamas cease-fire with Israel. Mahmoud Zahar, a senior Hamas leader, said that Hamas could, if it wanted, stop the rocket attacks out of Gaza. "But nobody will be the protector of the Israeli border" he vowed, meaning that Hamas would never agree to act as Israel's policeman in Gaza, a role that Abbas' militia at least pretended to do. But acting as enforcer over its fellow comrades may be the only way for Hamas to convince Israelis that it can deliver on its promises of a truce. The West Bank may be the next battleground between the Palestinian militants and Israel. The U.S. and Israel's plan to shower Abbas with money and concessions in the West Bank territories will never work, the commander vows. "The Israelis may give him money, but they'll never give Abbas a Palestinian state. The Israelis are still arresting people in the cities and towns. All we have to do is launch one attack in the West Bank and Israel will double back on all of its promises to Abbas." The only answer, the commander said, was for Abbas to renew ties with Hamas and give up on trying to split Gaza off from the West Bank. "This is what the Israelis want, and we Palestinians, as usual, will be the losers."